Bake your own bread - The truth about food and medicines. Bread baking is quicker if the flour and tins are faintly warm. The dried yeast can be thoroughly mixed with the flour in a large polythene bag before turning into a bowl and adding the water. Dissolve the salt in 150ml of boiling water before adding a further 250ml of cold water. Add the water slowly and mix until the flour is evenly wetted, then mix thoroughly for several minutes. The dough should be evenly wet and be slightly slippery so that it leaves the side of the bowl when tilted. Grease and flour the bread tins. Turn the dough on to a work surface and cut into two equal portions. Place each portion into a tin and press well down. Cut a line on each loaf from end to end. Turn on the oven to preheat to 240°C. Put the tin inside a large polythene bag and leave in a warm place for about 15 minutes - just until the dough BEGINS to rise. Before putting the tin into the oven press the dough back down at the sides of the tin so as to give it room to rise in the oven. The dough should NOT be allowed to double or rise and puff up as with white flour - but smoothing out on top and seen to be rising. The bread will continue to rise in the oven. Cook for 30 minutes then remove the loaf from the tin and return it to the oven for a further five minutes. When removed it should sound hollow when tapped on the bottom. Note: It is economical to make twice this quantity (1.2kg flour) putting one loaf in the freezer and eating the other. Only one sachet of yeast is necessary. This saves oven time. Of course, the best possible way to ensure that the flour is fresh is to mill your own from the actual wheat grain using an electric stone mill. This way all the goodness is retained right up until the time of milling. 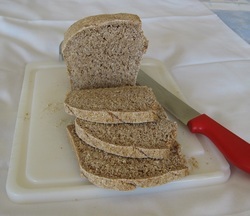 The wheat grain should be organically grown to avoid any residues of pesticides which can accumulate in the bran layer. The resulting flour should be used within 36 hours of milling after which time it will begin to lose some of its nutritional value.